This shop has been compensated by Collective Bias, Inc. and its advertiser. All opinions are mine alone. #WonderfulYourWay #CollectiveBias The following content is intended for readers who are 21 or older. For many busy parents date nights out are a rare vent. And to be honest, for me and my husband, they are almost non-existent. Since our parents live far from us and can’t babysit, it’s practically impossible to get out of the house without kids. Being a mother of two has taught me how to find a practical solution in every situation. When there’s no opportunity to go on a date night, there are still lots of ways to create a romantic atmosphere at home even with kids running around. If you are a busy parents and my situation speaks to you, here’s what I suggest to make date nights at home fun and memorable. Kids come first. If you want to make your date night at home as stress-free as possible, you have to get your kids busy. If you have young babies, put them to bed earlier. My older daughter is 4, so it’s impossible to put her to bed early. But my youngest daughter’s bedtime is at 7-8 so when she’s in her bed, it’s much easier to organise a date night. If kids aren’t sleeping, prepare different activities for them that they will more likely to be engaged with for a longer time. In our case, it’s usually pulling out toys that were hidden and they haven’t played with in a while. So whenever my daughter get these toys, she would play with them like they are new, thus leaving us some quite time. Set the atmosphere. I get it, it feels weird to dress up and pull out a romantic setting in your own house. But in order to make a dinner special, you’ve got to work on the details. Pull out a beautiful dinnerware and glassware, lit the candles, put on a nice music and last but not least – dress up. Pretend like you’re going to a restaurant and prepare your best outfit. Think of the menu. Prepare simple appetizers to tease those taste buds before the main meal. I suggest Caprese Salad or Polenta Bites With Black Olive Tapenade. Think of the beverages. Since I’m preparing a seafood dish, Pinot Grigio would be the perfect pair to my recipe. Now on to the main meal. You want it to be special, right? Yet mouthwatering and easy to prepare. 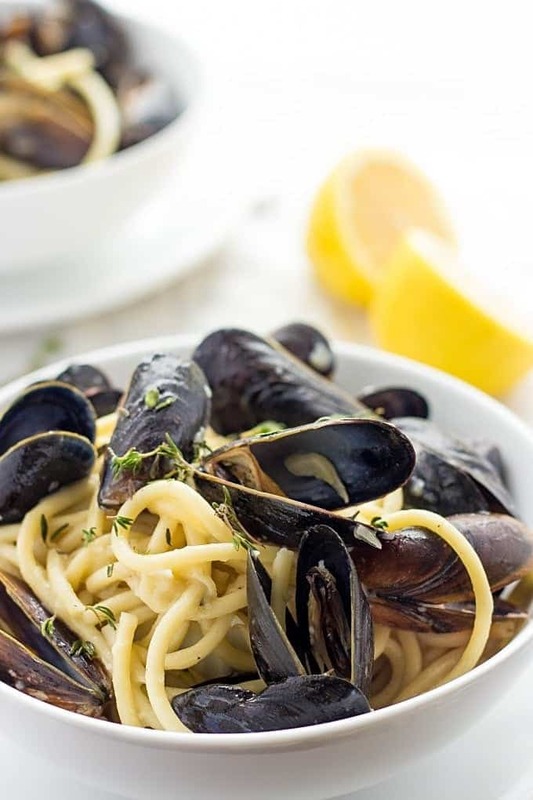 Here’s an idea – Mussels Bucatini in a White White Sauce. It’s creamy, flavorful and so good! This is definitely a Valentine’s Day worthy meal. I hope you are sold. So here’s what you need. 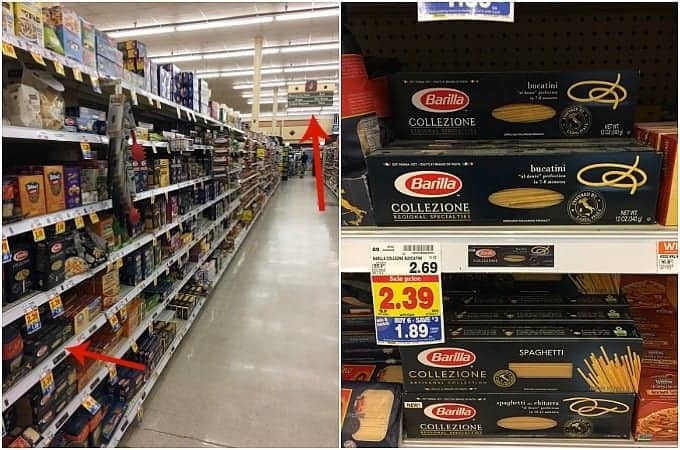 First – head over to your local Kroger Store in the Pasta aisle and get Barilla® Collezione Bucatini. I’ve been using Barilla pasta for years. It has a great taste, simple and you can’t beat the quality of the product. Next, you need fresh mussels. Make sure to clean them and discard any open shells prior to cooking. You’ll also need a good dry white wine. Pinot Grigio would be a good choice. Bring a large pot of water to a boil over medium high heat. 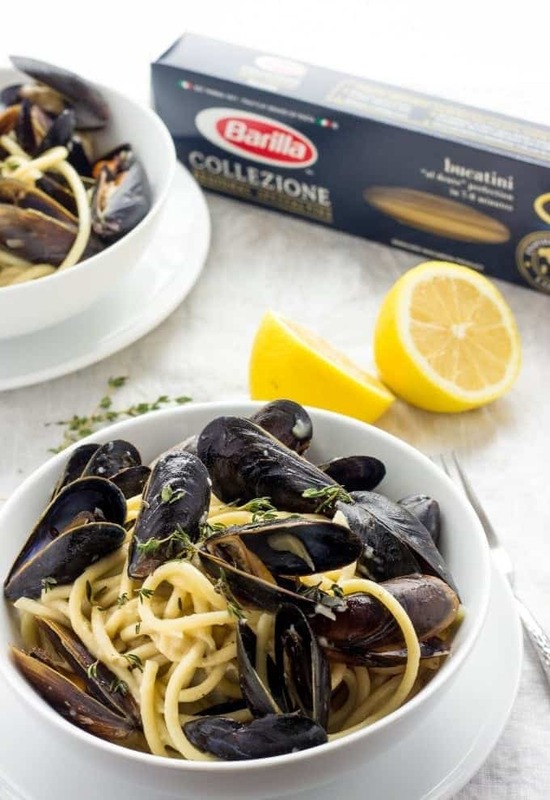 Add Barilla® Collezione Bucatini and cook for 7-8 minutes until al dente. While you're cooking pasta, heat olive oil in a large pot over medium high heat. Add shallots and garlic and sauté for about 3 minutes until translucent. Add 1 tablespoon of thyme, lemon zest, white wine, mussels, salt and pepper. Give everything a nice stir and cook until mussels are cooked, about 7-10 minutes. 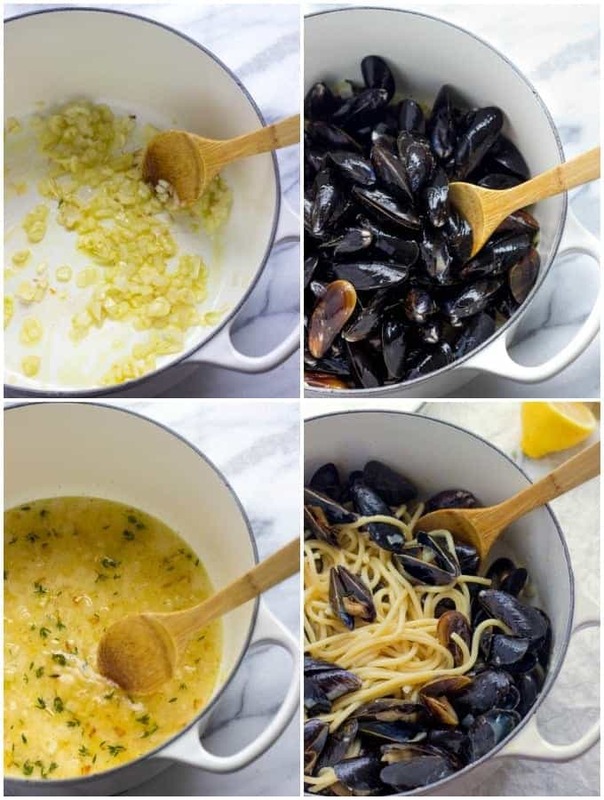 Drain pasta and transfer it into the mussels. Stir and serve immediately. 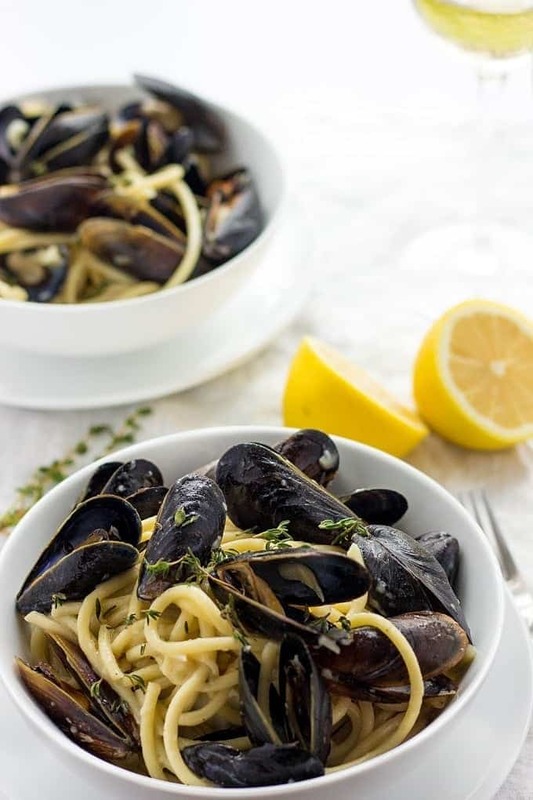 Sprinkle the remaining tablespoon of thyme and pour over a mussel sauce. You know, I don’t think my husband and I have ever set up a romantic dinner at home. I like the idea of going all out and getting dressed up like you are heading to a restaurant. Nice tips, and great recipe!